"I wanted to embrace the beauty, the royalty in us." 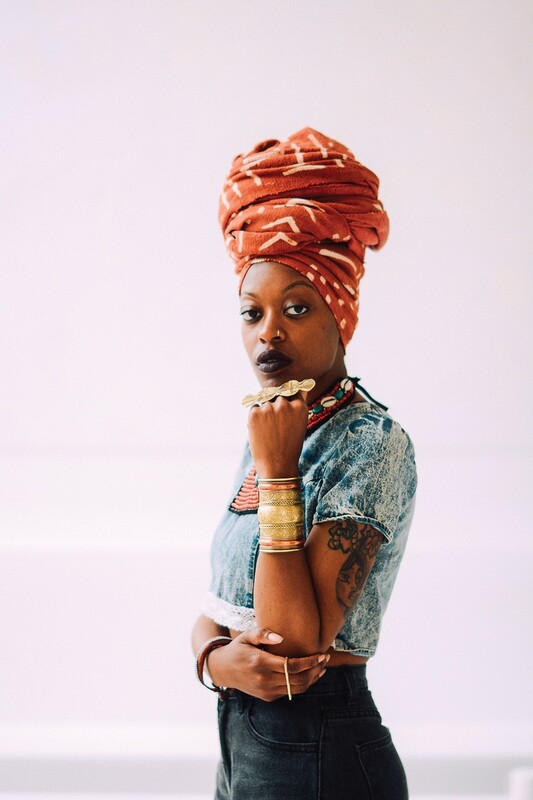 Brittani Sensabaugh hopes her images will uplift the Black community. Brittani Sensabaugh chooses her words carefully. She avoids the term "Black" — she says it's too political — and says "melanated" instead. She objects to having "fans" because it sounds weird. She prefers "supporters." She admits to being a "photographer" but likes to use "documentarian" more. The deep East Oakland native speaks slowly, planning her words before she utters them. In turn, her sentences carry so much heft that you want to hang onto them for a while. This, combined with her talent behind the camera, makes it clear why Sensabaugh, also known as Brittsense, has become one of the most talked about emerging artists in the Bay Area. In the last two years, she's been featured in Essence, Ebony, and O, The Oprah Magazine, in addition to a slew of local and regional publications, for her work documenting marginalized communities across the country. Now, she's out with her first book, The Power of Melanin. Sensabaugh rose to national prominence with her 222 Forgotten Cities series, which saw her traveling to cities such as Chicago, Philadelphia, and Baltimore to photograph neighborhoods often described as merely crime-ridden. While many of those images portrayed harsh realities, The Power of Melanin is meant to uplift, nourish, and heal. For folks who saw Sensabaugh's exhibit at Betti Ono last year, some of the photos will look familiar, but The Power of Melanin also features work from more recent trips to New Orleans and Jamaica. "I created this book for my people," she said. "We're so bombarded with negative imagery, and we're not telling our own narrative. ... With this book, I wanted to embrace the royalty, the beauty in us." Across 94 pages and nine cities, The Power of Melanin brings together images of natural hair, smiling faces, fresh fruit, and colorful flowers with some of Sensabaugh's favorite affirmations. It's a window into how Sensabaugh sees the world, full of honesty and love for all things. In one spread, for example, she juxtaposes an image of a young man with long dreadlocks against a close-up of slender, tangled green beans. "When I close my eyes and I see a picture of him, I also see this. It's one and the same," she said. "I wanted to put us in the mentality of thinking of ourselves as nature — because we are." "The mission behind it is for people to be able to see themselves at the root, for them to see themselves purely," she said. She wants them to recognize that the melanin in their skin is also in fruit, vegetables, and nature. And she wants them to view melanin — and good food — as energy that empowers them. Sensabaugh also hopes her images will encourage people to become more transparent. "We're not transparent within the melanated community because we've been taught to go against each other," she said. "We've been taught we're a threat to each other, so we're very separated." With smartphones and social media, Sensabaugh feels that people have become even more guarded. "We're very numb. We're very distracted," she said. "So, we're not able to look at our traumas, our triggers that we face daily in society." As someone who battles depression and anxiety, Sensabaugh has found solace in self-love and mantras, including the ones she wrote for The Power of Melanin. A quick sampling: "Build your tribe," "Rise," "Breathe," "Your health is your wealth," "Release ego so joy can come." "Not to be vain but I made this book for me, too," Sensabaugh said, laughing. "I look at this every day." In addition to the positive affirmations, the book also reminds Sensabaugh of her own capabilities. She said she always dreamed of starting her own business, and now she's done it — she launched her own media company so she could publish The Power of Melanin untainted by other agendas. She wouldn't have trusted another publisher. Too often, she said, things Black people say get twisted in the mainstream media.